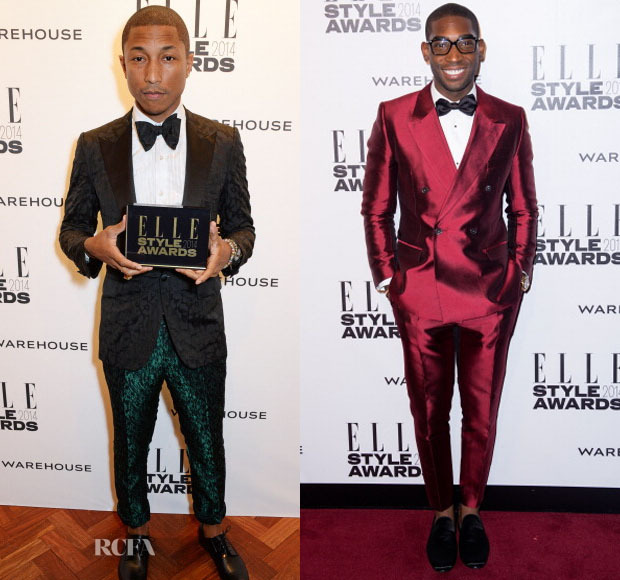 Here is a quick look at some of the fellas on the red carpet from this evening’s (February 18) Elle Style Awards 2014 held at London’s One Embankment. Pharrell Williams: Not picking up the Best Dressed Man of the Year (although he should have) the musician was happy with his International Recording Artist of the Year award. No surprise that he’s wearing his go-to designer Alber Elbaz; wearing a head-to-toe Lanvin Pre-Fall 2014 look consisting of a black leopard effect tuxedo blazer with satin peak lapels, and black-and-green two-tone cropped trousers. His white cotton tuxedo shirt with accented pearl buttons and styled with a signature black bow-tie, with black leather derbies rounding out his look. Thank god he left his Vivienne Westwood Mountain hat at home. Tinie Tempah: The British rapper continues his epic run this week, attending his third fashion-related event in as many days. On this occasion to collect his UK Recording Artist Of The Year award you could see him from a mile away wearing a manly magenta Dolce & Gabbana double breasted suit, styled with a black bow-tie and loafers, obviously. It’s a bold look. Not many dudes would even attempt to pull it off, but I gotta say he makes it work, even though I am not a fan of shiny suits. Will Poulter: Fresh from collecting his Rising Star Award at the BAFTAs on Sunday, the British actor went in a totally different direction from Pharrell and Tinie. Also wearing Lanvin, he kept it classy wearing a navy blue two-piece wool suit with black patent derbies. David Gandy: Like Laura Whitmore, David opted for a British high-street retailer wearing a classic windowpane Marks & Spencer three-piece suit styled with a white dress shirt, grey tie and matching pocket square.